This is the first picture I got of my horse almost done, with the first pass on the base. 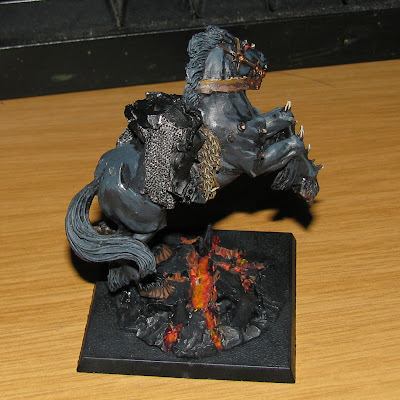 I've done the horse color by mixing Chaos Black with Codex grey in many layers, then adding a bit of Fortress Grey and Asurmen Blue to give it a blue-ish tint. The lava was done in a few passses of Mechrite Red, Blood Red, Blazing Orange and Sunburst Yellow. 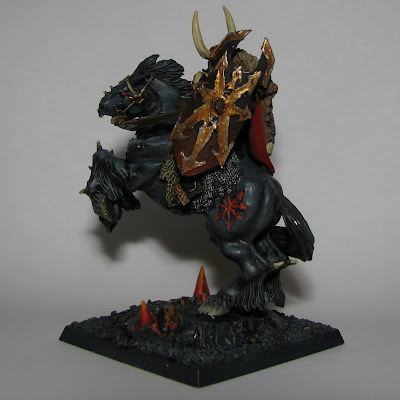 Here's the cloak (inside) and horsey placed besides each other, as well as proof that I DID paint it for the competition :D Also have a look at my marvelous handwriting. Following, there's the final product, indicating with his sword that YOU are his next target. 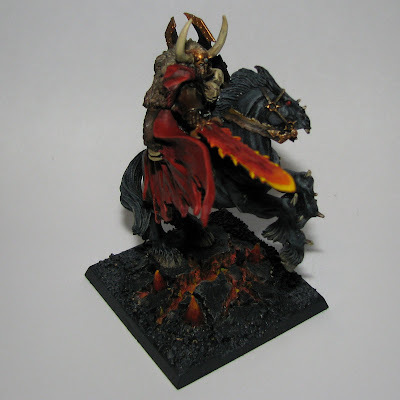 In the next picture you can see a better view of the base, cloak exterior which was painted in 7 layers of red, as well as his flaming sword. 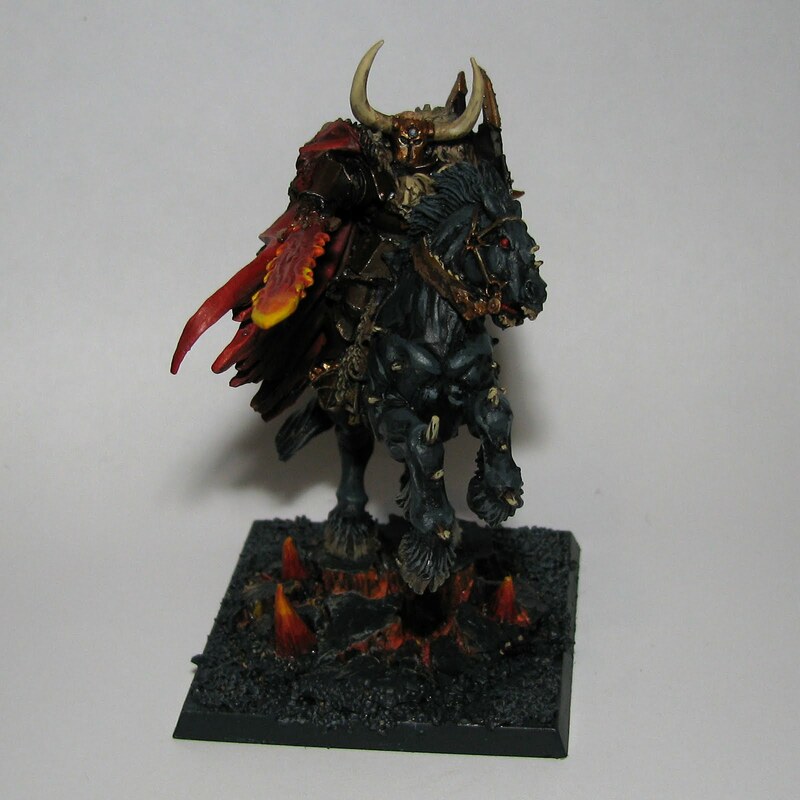 For this side shot, Archaon shows us his shield which is a bit battered. The horse doesn't agree with him carrying that insane amount of metal on his back. The shield was painted in the color of the armor, which is basically 6 layer mix between chaos black and blood red, going up to a rust color at the highest intensity. And finally, a better view of the furry shoulders and sword. The shoulders were made by blending 2 shades of brown, namely PP Jack bone and PP Bootstrap leather. The sword was done in a 7 stages, going from Mechrite Red, Blood Red, Blazing Orange, PP Cygnus Yellow and with a Baal Red wash in-between. I got some Forgeworld shoulderpads for my terminator squad. I'm going to make a mixed unit, part Space Wolves, part Salamanders, part my own chapter. What you see in the picture is the first go at the Space Wolves shoulderpads. I still need to clean it up a bit in order to make it final, but I'm pretty happy with the result. The only thing I'll do differently is go straight for silver metal rune plates instead of what I did here. I tried to make them gold, but then I realized that the contrast will be quite weak (hence the brown rune writing). If those were normal pads, I would go again with the color over them, but as the rune writing is so thin, another layer of any paint might ruin it forever. I've painted this Deffkopta squad as a gift for a friend. They're not as detailed as the other deffkopta that I previously posted, having only 3 layers in average per surface in comparison with 5 for the solo kopta. The props are all magnetized and interchangeable. Here's how they look. I have finally finished the nob. It's a great model and I recommend anybody who collects them to take their time and paint them properly. 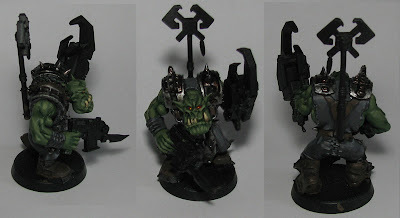 I did not do the base, because this is a model that belongs to a friend and I have no clue how he's gonna base his nob squad. 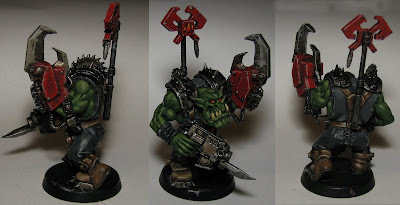 I got an ork nob from a friend to make some color tests on it. It's gonna be a Goff nob, but there's still a lot of work to be done on him. So far the green skin and leather clothes are done, but I'll finish it soon. Door sets for the Rhino chassis just in case I don't use them as Predators. These are my first painted marines. The one in the right with the double plasma pistols is my first model. As you can see, there is not much unity in these guys, mainly because on each one I tried a new painting technique and then decided to stop in order to have a summary of what went well and what didn't. Also, these are mostly AoBR marines, with a few exceptions. 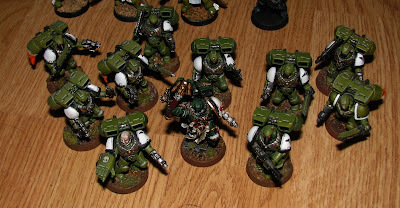 This is my assault squad, 5 of the marines have some green stuff work on them in order to create some jetpack flames. The chaplain in the middle was my first painted metal model and helped me change the techiques I have been a lot, mainly because I didn't want to mess it up :). Here's a close-up of the model. Following is the squad where I finally decided on a proper color scheme for my army. These guys were made also to stand in for a Sternguard squad in case I ever need one. Next is another tactical marine squad that I painted because I needed some extra marines for games. This is also the first squad that I used edge highlighting on. This scout squad provided a much welcome break from the standard armored space marines and gave me the opportunity to learn about cloth and painting faces. 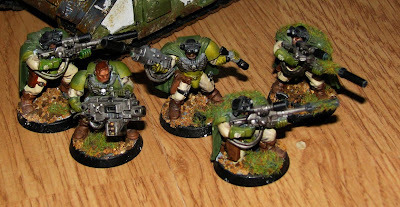 On the snipers I have made extensive use of drybrushing and washes to give the clothing a somewhat natural look. It went ok for most of them. On the heavy bolter scout I tried to use layers to create a more realistic face, instead of using washes and drybrushing as before, and it paid off. In the next picture we have a sergeant for the sternguard/tactical squad and my librarian conversion. 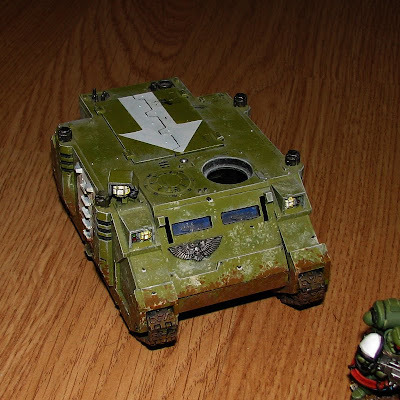 The sergeant has one of my first good face painting jobs , following the example of the heavy bolter scout. The librarian is a conversion on which I used all kinds of cloth, leather and scrolly looking bits. He was painted using several layers of paint , especially on soft surfaces such as skin and cloth. The Ripper that's lying dead there is also painted using several layers and lots of color mixes. 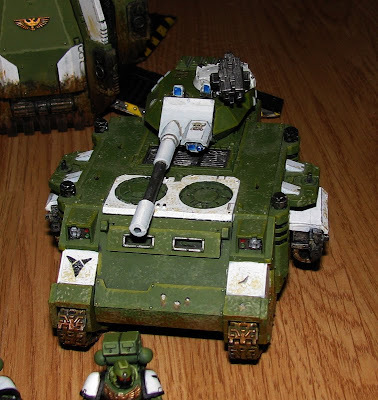 Heavy weapons are always fun, because they are huge, are easy to assemble and you can paint them in all kinds of ways. For the weapons I tried various effects such as highlighted or glowing wires, glowing plasma exhausts, etc. 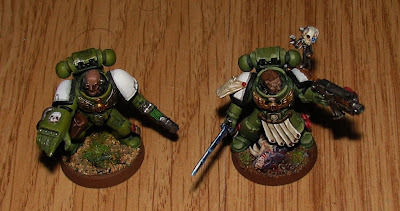 Also, these models is where I started to freehand my chapter logo on the shoulderpads. Following this squad I have went over older models and put logos on their shoulders. On to the vehicles, this is my first painted and assembled Rhino. It has some assembly problems, but much of them have been covered through painting. 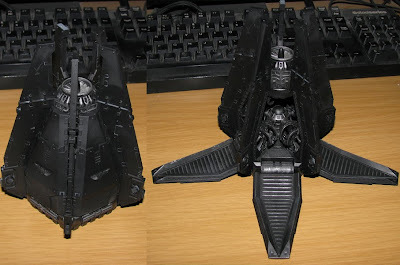 This model is the only non-magnetized chassis that I have. All others can be converted into a Predator. The hatch tactical symbol is painted by using masking for the arrow with a brush over sticky tape. This chassis was completed long after the 1st one. 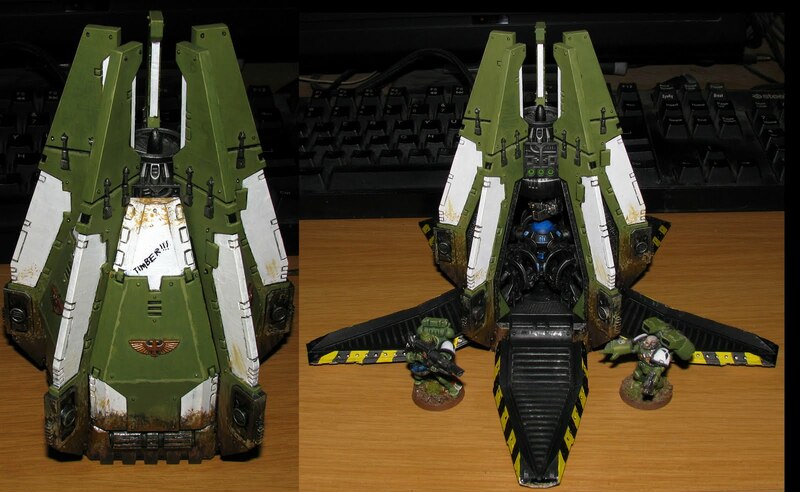 Here I used my chapter colr scheme, and I finally stopped fumbling with colors painting large surfaces. 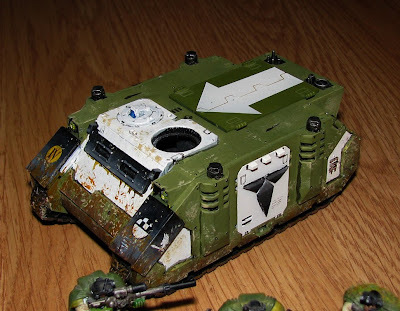 This is the first model that I weathered with mud using several layers of brown colors, technique that I applied on all my other vehicles. 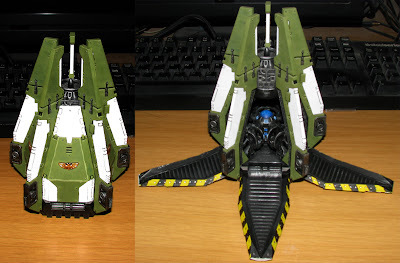 And last, but not least, the drop pod. It's the single most difficult to paint model that I had to do so far (I have 2 land raiders to assemble though, so it might get knocked down to 2nd place ). The plastic is of amazing quality, everything fits almost without gluing stuff and it also requires a great deal of attention during the last assembly phase. And this is it :) I hope you enjoyed it. 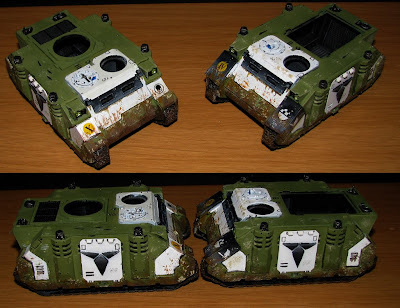 A small update on the rhinos/tanks. I've finished painting the big surfaces, metallics, washed in the details and did some minor cleanup. 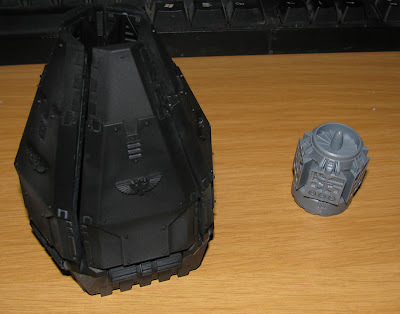 Also, I've tried my hand a bit on some NMM for the custom doors and the tank turret. This is how everything looks in its current stage, and it will look better in the future. Finally, after about .. I don't have any idea how many hours .. 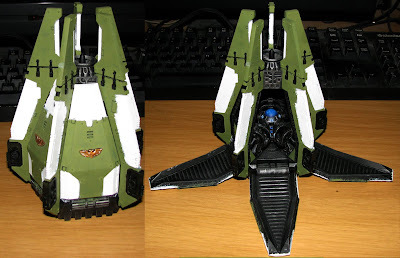 I've finished the drop pod. Theoretically I'm almost finished with the drop pod. I've finished the metallic parts, cleaned-up stuff, painted the rivets, did some edge highlighting on the edges pointing upwards. For the next step I'll glue the model together, add the missing storm bolter , add some dirt and burn marks and it should be finally done. Another update, this time I've done the metallics, danger lines and some more cleanup on the black parts. After completing the metallic bits I'll go into full clean-up mode and after that proceed with weathering. Quite some time since the last update, mostly because other pressing business :). 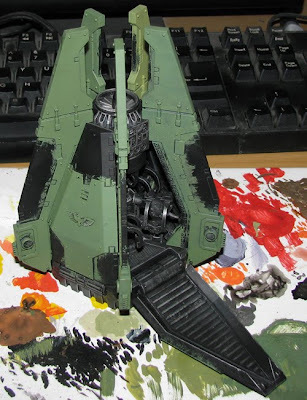 However, here is a small update on the drop pod. It's a huge model , with lots and lots of details to paint. What I've done so far is finish painting the big areas with their respective colors. The white needed about 5-6 coats to get right, 2 of Astronomican Grey and 3-4 of P3 Morrow White. 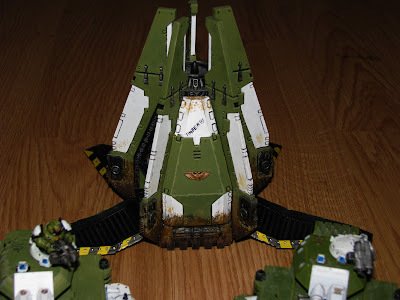 What's left to do is paint the exterior metalic surfaces (now in black) , use washes and inks in the creases to add detail, do the danger signs on the drop pod doors and add the weathering. I have basecoated the green portions of the model with the regular Knarloc Green. It went pretty fast, because I tried to paint in a cross pattern and the foundation paints seem to love this way of applying paint. Basically what I did is wet my brush a bit, squeeze almost all the moisture then get some paint on a large drybrush. With this I painted one layer from top to bottom and one layer from left to right. As you can see from the picture, the result is messy on the edges but very uniform where the paint should be. All the green areas took some 30 minutes with some slacking and waiting for paint to dry between layers. Next up will be finishing the greens, then cleaning up and going for the white portions. 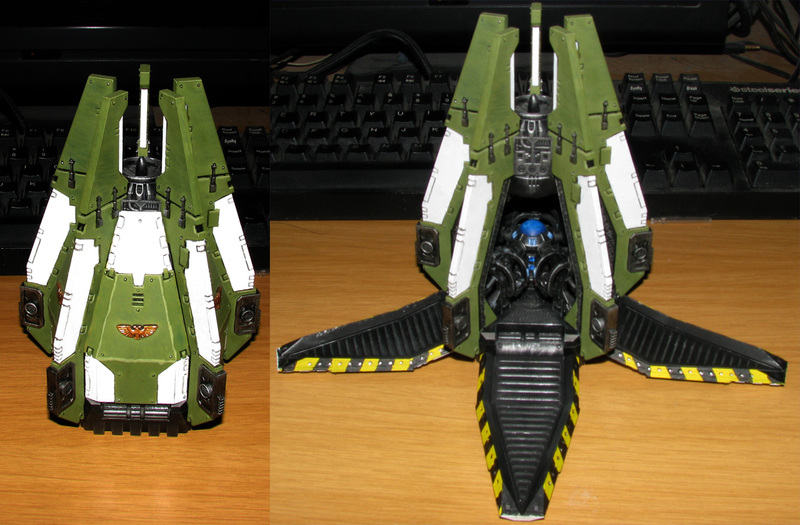 I have finished doing the basic metallic drybrush on the drop pod. It's a great model, the best I've assembled until now as far as how everything fits together. The pod in the picture has many pieces that are not glued together, and is stable enough to handle and test various things. The assembly instructions are lacking one small detail: the marine harnesses need to be placed on the pod's floor together with the central console, otherwise you would have to cut some of the plastic in order to place them correctly. This is what happened to me while building this drop pod, but it's not noticeable by any means. 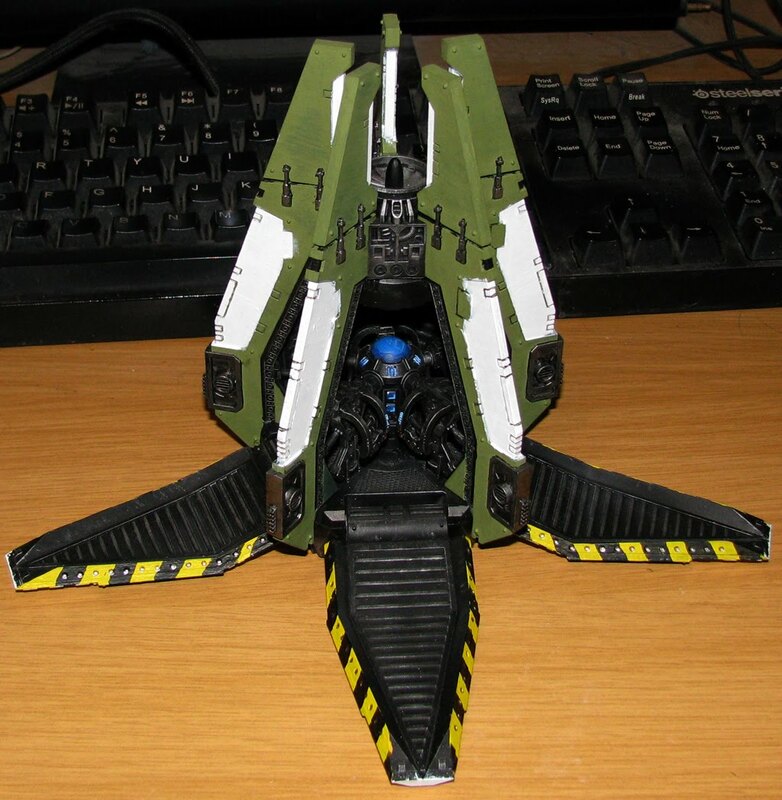 Also, if you want to have a good looking painted pod interior you may want to paint the harnesses and the console BEFORE glueing them to the pod's floor, otherwise you won't be able to reach the console with your brush. 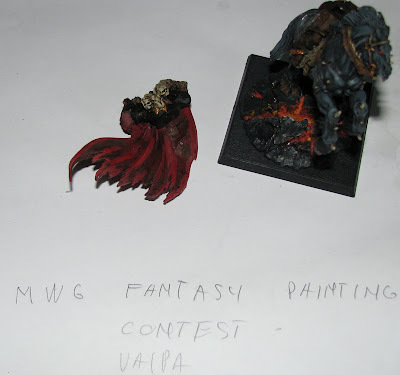 The picture above is the 100th picture I am uploading to the blog after about 1 year since I've started painting miniatures. It's not 1 year yet, but we're getting close. It's quite nice to see how much one person can progress from absolute 0 to .. more than that just by practicing and dedicating some (not a lot) of time to a certain field. So I guess the moral would be that anything can be learned up to a point if one practices enough. 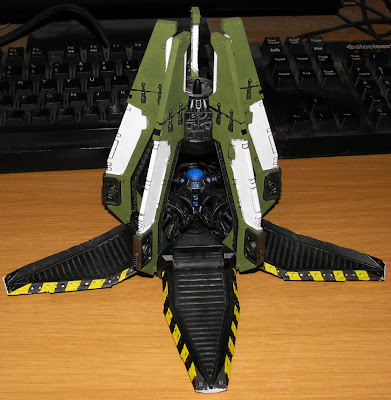 I got a new transport in the mail today that had 2 Drop Pods and a Land Speeder Storm, so I quickly tried to assemble one part of the drop pod, namely half of the interior. Much to my surprise, I failed to see some of the hints that the assembly guide showed me, such as gluing the panels on the top turbine upside down :) Oh well, now I'll have to live with a little strange drop pod. Added the official Retribution of Scyrah units for MK1 (the planner is , at the moment, MK1 only). 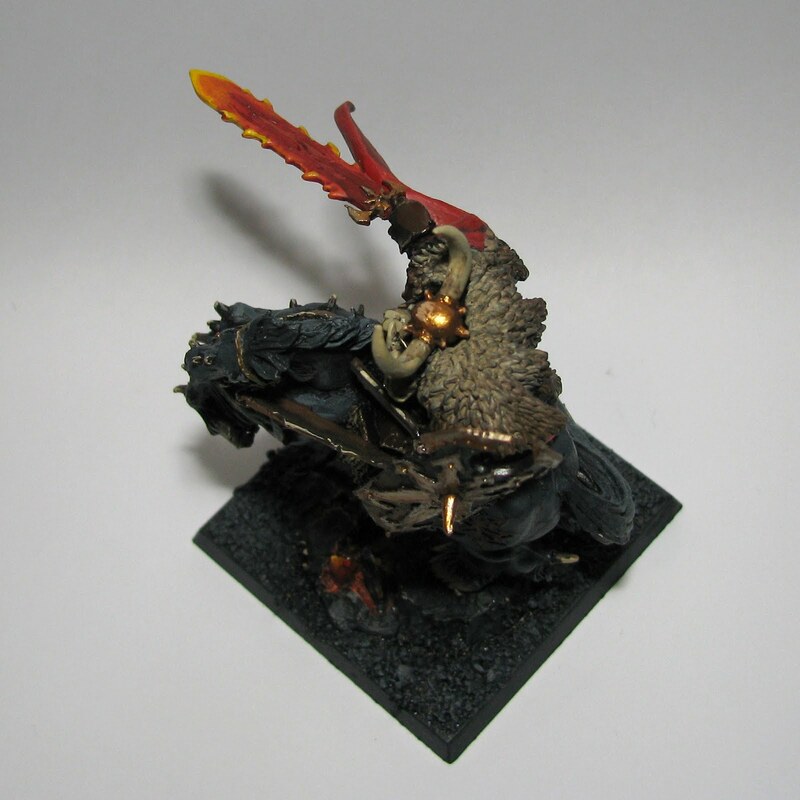 This makes the database 100% complete for MK1 Warmachine and Hordes. Made epic warcasters and warlocks respect the 750 point limit minimum. So, if you don't see them listed in there set the maximum points to over 750 and they'll show up. Hopefully, if time allows, a new interface for the planner will be up by the end of the week and it will mark the closing of the development of this small piece of software. Following that, the MK2 planner will be in the works. Everything should be much faster and more compact while taking advantage of everything that has been done for MK1 so far. 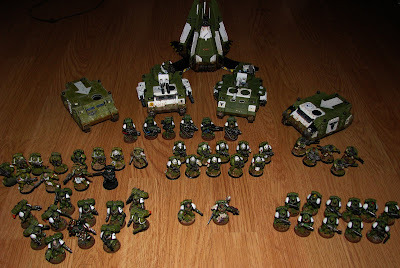 Here are my devastators and the rest of the marines that I needed for my list. 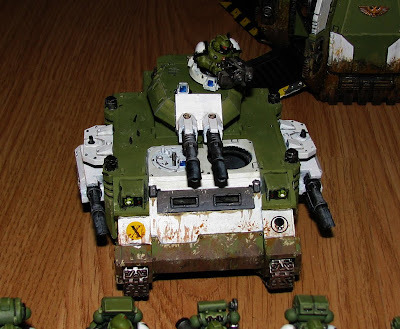 Heavy weapons are a bit "harder" to paint than normal bolters and handguns, because of their large surfaces and the need to cover them in more than one color unless you want them boring. After a week or more of not touching a model, here's a small work in progress shot of my devastator squad. The armor including highlights is pretty much done, however there are still some minor touch-ups to do here and there. Weapons are also WIP, but not much work has been done on them apart from metallic brushing and washing. Here's the Khador Destroyer that I've finished. I tried two different paint sets on it. The body is done with Vallejo model colors and the arms with P3 paints. As you can see there is not much difference excepting for the paint fluidity which will improve with practice. 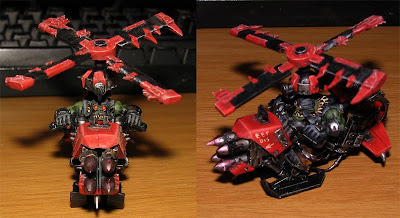 I tried to use as many P3 paints as possible to make the warjack look as close to the reference models as I could. It's not really there, but I'm sure the quality will improve with the next 'Jacks. I've been working a bit on the warjack arms that come with the battlebox. I believe I'm quite ready with the red part over there, but I guess I'll try and to an extra layer of highlights for the Khador Highlight color, because at its current state it will blend perfectly after varnish is going to be sprayed on. I've cleaned up all the non-red parts with Thamar Black , and the next stage will be to paint the metallic pieces and make them look good. Also, in the image above you can see my first attempt at non metalic metals on the bombard cannon arm. The Warmachine planner has been updated with some minor fixes regarding field allowance (Fenris, Zerkova, Gun Mage Adept, Yuri the Axe) as well as made the epic versions of characters to exclude the non-epic from the list and the other way around. Hordes factions and minions are also complete , so you can plan out your Warmachine AND Hordes list on the same page. I'm considering some interface improvements but they will have to wait a bit because of some unexpected developments in a very important project I'm working on. I have also added a link to the Warmachine planner on the right navigation bar, right below the BOLS mini-banner. Closing the Warmachine section, if you have any suggestions for the planner or spot any inaccuracies in the unit prices, field allocation values , etc don't hesitate to send me a message here or comment on the blog. 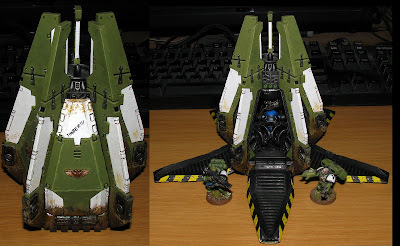 On the 40K front I'm seriously considering getting a couple of Land Speeders Storm to make a strong 1000 point list. Won't use them both at the same time, but still. Finally, after severe slacking in the painting department I have completed the librarian. I've also added added a small ripper to the base, just to make it look different. Here's my first terrain piece. 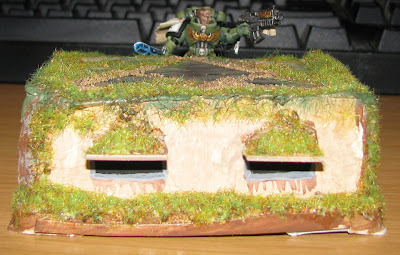 It's a bunker made out of a Warmachine blister, plasticard, and some green stuff. Unit tooltips have been partially implemented - I'll need to get a word from PP people in order to fully implement or eliminate them. Add units window has been altered a bit. Compressed view checkbox - this simplifies the army list a bit, only showing essential information. 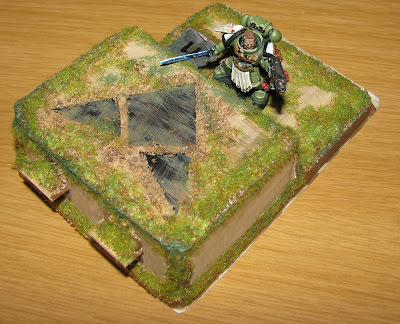 This is a site dedicated to tabletop wargames and army lists. It is still under heavy development, but you can access some sections. Look around and enjoy your stay!. Click here for the Warmachine army builder.